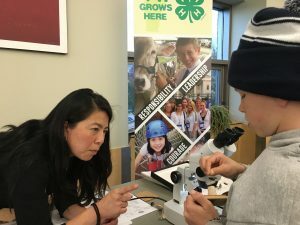 On Saturday October 20th, youth from across Vermont gathered at the University of Vermont (UVM) for a presentation from Dr. Yolanda Chen and her graduate students to learn about their study of…bugs! Teen Science Cafés are a wonderful opportunity to step out of the conventional classroom space, and explore the STEM field through engaging hands on activities. The Café began with an overview of why scientists study bugs (entomology). Dr. Chen provided insight into the expansive world of insects sharing that an amazing 8,000 new species of insects are discovered every year. Chen’s brief, but engaging introduction on the importance of entomology generated a lot of excitement and curiosity surrounding her field of study. Following Chen’s presentation, two of her graduate students, Elisabeth Hodgdon, and Erika Bueno, shared their work in the UVM Insect Agroecology and Evolution Lab. 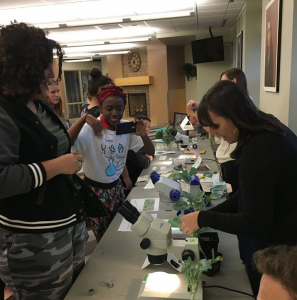 Seeing young people in Vermont who are researching really interesting STEM topics was definitely impactful for the middle and high school age participants. Elisabeth Hodgdon studies an invasive species called Swede Midge that infests vegetable crops. As agriculture is very prevalent in Vermont, the impact of the damaging Swede Midge on Vermont farms became relatable to most of the audience. Hodgdon spoke about her search for a solution to the growing Swede Midge population including spraying synthetic pheromones on infested crops to prevent mating. Erika Bueno studies the Colorado Potato Beetle (CPB), also an invasive pest to U.S. crops. Bueno is researching how stressful environments influence the genetic mechanisms in CPB, and different forms of management including insecticides, crop rotations, and utilizing natural enemies. Both presentations left many of the students determined to find their own solutions to the destructive species. 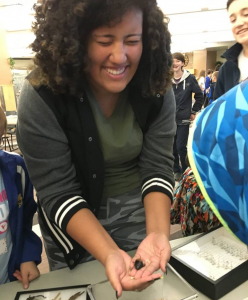 In one of the most engaging hands on activities of the year, Dr. Chen and her students brought various species of live insects for students to observe and interact with including Swede Midge and Colorado Potato Beetles. Students were given the unique opportunity to handle, and study insects similar to how an entomologist might. 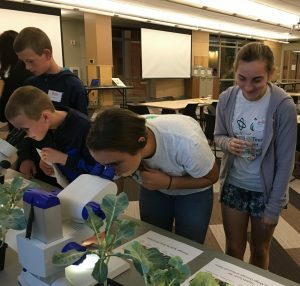 The activities were grouped into multiple stations: how to identify Swede Midge, how to identify a wide range of bugs and a look into the various life stages of Colorado Beetles. By 7pm, when the café ended, the amount of curiosity and excitement about bugs (and entomology) was crazy! Thank you so much to Dr. Chen, Elisabeth, Erika, Andrea, and Chase.